Hubei Shennongjia is a forested mountain massif mostly known for its floral diversity. It has been a place of significant scientific interest particularly for botanists. It lies within the Daba Mountains evergreen forests ecoregion, in Central-eastern China. The site consists of two locations, Shennongding/Badong and Laojunshan, separated by a 10km wide corridor. Some places just take a lot of effort if one wants to visit individually and I feared this would be the same. I hate tours in China and they tend to spend more time on shopping stops than sights, but there is a tour from Enshi that takes you to this and other places worth seeing, if only I had done all this before. The tours hardly touch the area at Shengnongjia so actually don't do this! You can either come in by bus from Yichang East (the airport shuttle's first stop), 3 and a half hours max with mostly G standard roads, or you can fly in from Shanghai/Wuhan to Hongping airport which is another hour from the scenery areas. The bus stops at a town called Muyu and has several rides a day. In the busy time you can also find minivans going back to Yichang. The official bus terminal even hands out these cards of the drivers if you want an alternative transport. You don't actually need to stay in Muyu but it's a good hub. If you spend more time at the other areas you can stay at a hotel over there which saves some time coming back to Muyu at the day but obviously you would have to arrange transportation or have your own car. Muyu has lots of hotels and tour drivers, so I tagged on with a group of people from Canton and each paid 100 RMB for the day, excluding entrance tickets and lunch. The 5-day pass to the area, which is really huge, combines everything you can see into one card that gets your fingerprint attached to it so you can't transfer the card, you can also pay single tickets if you don't go to more than a couple. As you can tell this is one of those places you ought to stay at least 2 days. I am unfortunately not sure which areas are in fact included in the world heritage list. The big “forest” areas that surrounds the towns is actually called Shennongjia. The individual sites are all listed as UNESCO biospheres and the signs have either not been updated to the inscription or are simply not part of the inscription, which I read is perhaps inaccessible to tourists. The highlight of the trip was Shennongding, or peak. The trip is mostly short stops by car. As it was already November the park's shuttle didn't run anymore so unless you have your own car you will rely on the driver picking the destination. Honestly they know what they are doing and show you the best parts, and know where to start early for the best views and before the crowds arrive. Shennong Valley has an amazing cloud-covered stone forest which I would immediately inscribe for beauty. The wow affect doesn't come often if you have seen half the world. 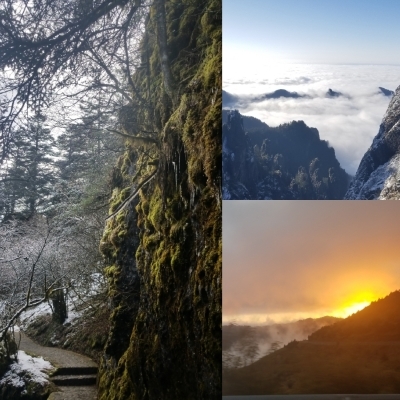 Moving on, the karst rock formations with labeled animal names form another beautiful walk that alters between mossy rocks, snow covered leaves and beautiful views of the surroundings. The walk is not easy at 3,000m high altitude if steps take you up and down . Along the path you get surprisingly very descriptive signs about geology, with perfect English translations! You learn a lot about this subcategory of karst, how the rock book sheets were formed, why the stone forest looks like it does, and the rare dying stromatolites, explosion of life, fossils, the list goes on. The tour guide will be more interested that you get views but they are easy to see. Overall I would prefer to spend one full day here before the flowers and birds disappear. There are several other round trip walks to do. The biodiversity here is so great sure you the elevation changes. I didn't actually see any monkeys around here perhaps they don't go to the tourist spots which I prefer over then getting fed potato chips or trying to steal your other snacks. Dajiuhu, Big Nine Lakes, was a rather disappointing bog marshland. The views are not good and the nature is brown around that time of the year. I would probably also spend a full day here in summer but not even a minute in autumn. The worst is that you have to pay another 60 RMB for a bus to take you around the park and the small electric train doesn't run anymore, meaning you have to follow another schedule, can't go to lake 7-9 and the other group on that bus didn't even want to stop at the Deer Park (it's not special but at least try to get some money's worth. Day 2 unfortunately was rainy and cloudy so most time was spent on driving and lunch. I will not review the experience because I am sure there is more to it if the weather allows it. I am still super happy with my visit aside from the required bus ticket that is often somehow done on purpose. Rather than have the parking lot further in they just place it miles away and require a shuttle from the visitor center, no excuse will fly here: it's an absolute money scheme. I could have walked everything from lake 1 to lake 9 in a few hours which is for me the purpose of the visit to a park, no ride required to chauffeur me around. I will give the peak a pure 5/5, the lakes a 3 and day 2 could be between 3 and 4. Would I come back? Absolutely yes! Would I check where exactly the world heritage area is? Probably not. There is no way I could control my visit in any other way. There is no taxi, the drivers don't know or care about the world heritage area, or simply think it's all included. The biosphere park designation doesn't help to distinguish it. It is located in western Hubei, not easy to arrive here by bus or by train, it takes 3 or 4 hours from Yichang, the nearest big city. Tickets are very expensive, especially considering the poor service, not a good experience. Car hiring are highly recommended, and don't trust the local drivers easily. Visitor Limits: From May 2018, "The tourism area, covering only 3.5 percent of the park, has six scenic spots. The Shennongding scenic spot has limited the daily number of visitors at 14,800, which is the highest visitor cap among all spots. 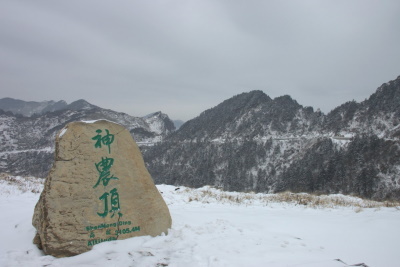 The Tianshengqiao scenic spot has the lowest daily cap, with 4,770 people."